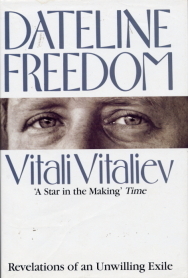 Vitali’s fearless journalism made him a national hero in the USSR, as well as a sitting target for the criminals he has helped to convict. In this book he investigates the continuing miscarriages of justice – punitive psychiatry, labour camps, rampant anti-semitism, lack of food, violence in the Baltic Republics – with the contention that it is still the same corrupt communist system, just under a new dictator, Gorbachev. Fearing for his life and after continuing attempts by the KGB to recruit him to spy for them, Vitali also records in full his desparate last few months which led to the heroic escape of himself, his wife and their 10-year-old son across the border into Poland in January 1990. This entry was posted in Bibliography by Dmitri. Bookmark the permalink.